After much planning and cajoling, we finally were on our way to vacation to Canada. We left home (Glenview, IL) at 7:30 AM (half hour later then planned) and arrived in Detroit, Michigan at 1:30 PM. Time moved ahead one hour. On the way, we stopped for 30 minutes for gas and food. We stayed at La Quinta Inn and Suites hotel and were very impressed by the high standards of this place. They offered free parking, breakfast, outdoor pool and a small gym. We checked in and changed and left to see Belle Isle, a 36 minute drive from the hotel. 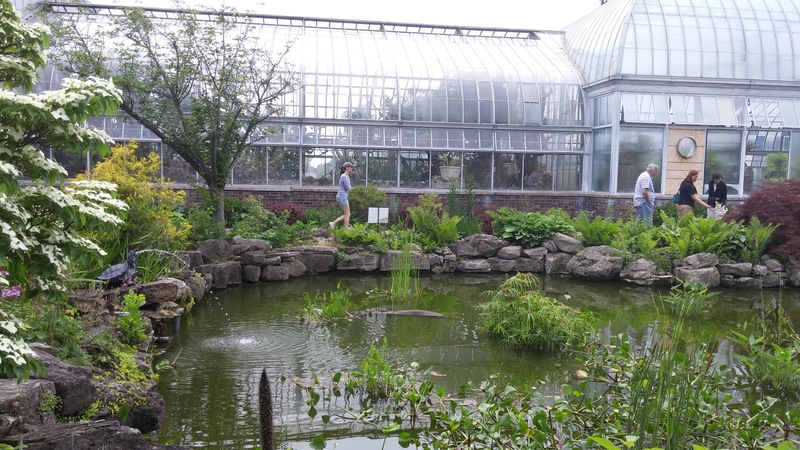 We saw the oldest North American aquarium, fishing pier and a conservatory. We took lots of pictures; some of which I will share here. We then just drove to downtown Detroit and looked at the city’s architecture. Tigers (Detroit’s baseball team) was playing against Cleveland Indians at Comerica Park. We saw stadium was full and people cheering. For dinner we went to Chilli’s restaurant and afterwards we did some shopping at GAP and T.J Maxx stores. We came back to hotel, changed and went to the fitness room and worked out for 30 minutes. Everybody was refreshed after the comfortable night’s sleep and substantial breakfast in the morning. 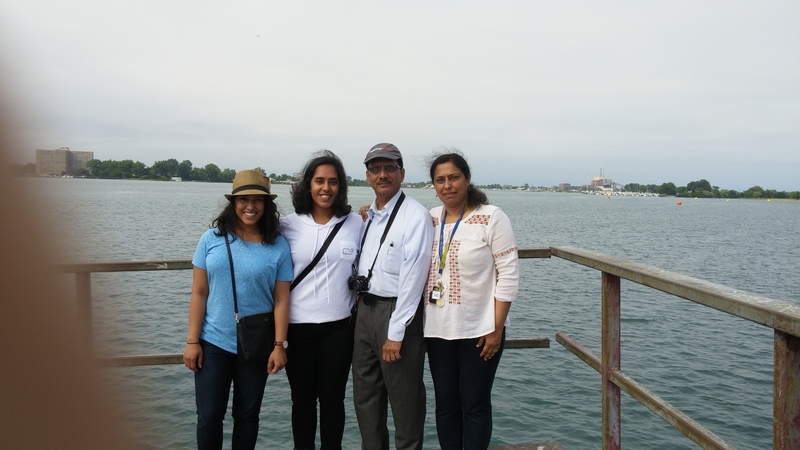 We resumed our driving at 9 AM and arrived at Niagara Falls, Ontario at 1:30 PM. We stayed at Marriot Gateway on the Falls hotel. Our room was on the 26th floor with full view of the Niagara Horseshoe Falls, American Falls and the Bridal Veil Falls. We could see the New York side of the Niagara Falls Park also. Weather was cloudy so the usual fireworks at 10 PM was cancelled that night. 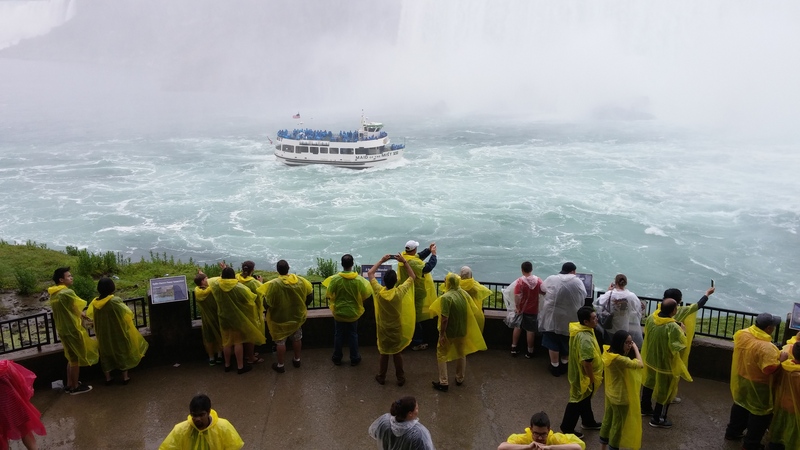 We booked a fully guided and narrated tour with Magnificent Tours and they took us to the 3 attractions; Skylon tower, Journey Behind the Falls and HornBlower Niagara Cruises. There were 12 people on the bus including us. We met a very nice family of 3 consisting of a grandson (age 16) and grandparents on this tour and most of the time we stayed together. Skylon tower was 775 feet tall and gave us the crystal clear views of the city of Buffalo, NY and Toronto. 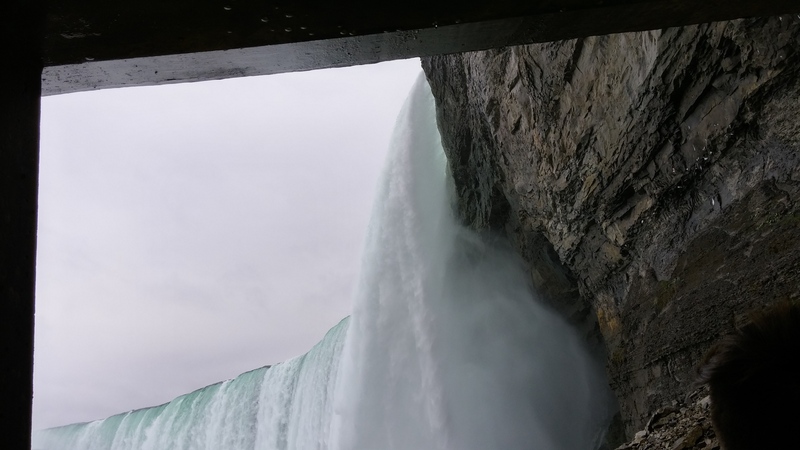 We could see the falls from the top, Rainbow Bridge, Goat Island etc. We took lot of pictures. 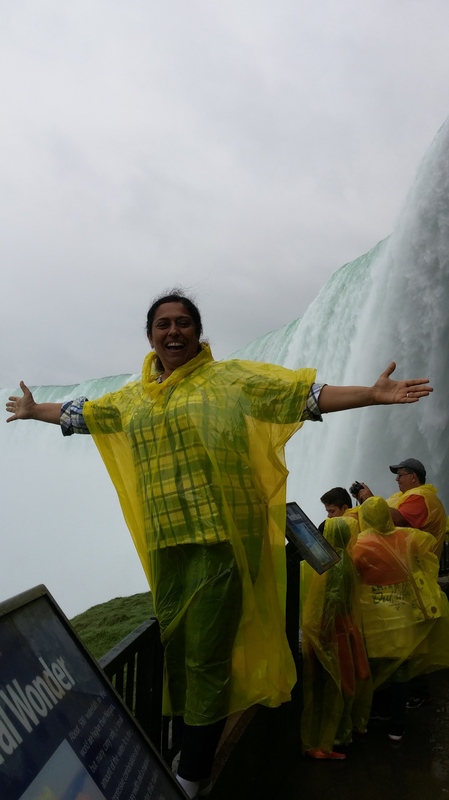 Niagara Falls Behind the Scene tour was an exciting and humbling experience. 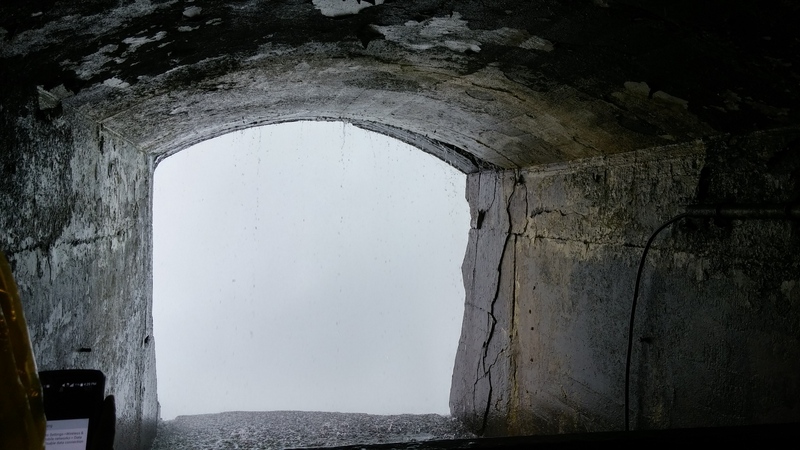 Tunnels were built under the falls and there were different viewing windows where you can see the falls from under them and can experience the power of them. It was like a hands on Falls museum with various historical facts about the place such as how those tunnels were built how deep was the fall in 1676 and every hundred years after that, showing how much corrosion and erosion has happened etc. Many times I feared that if this tunnel caved in today, there will be no sign of us. Look! how much fun I am having. Observation deck at “Journey Behind the Falls”. 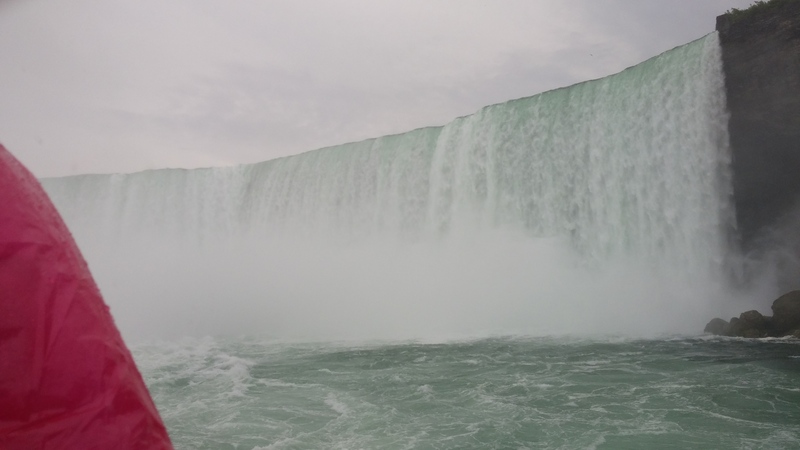 The 25 minute tour on the boat which took us close the Horseshoe fall was once in lifetime one. 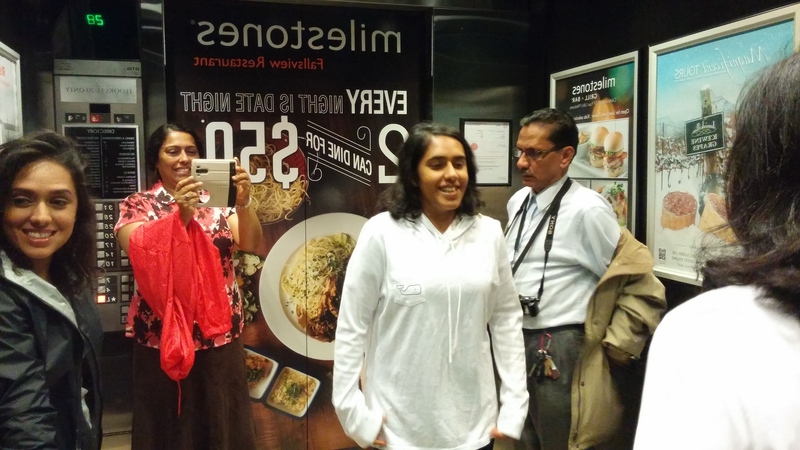 We dined at the magnificent Milestones restaurant at hotel where we were staying. Two days ago, I attended a one day training session on the topic of “Dynamic Public Speaking” from the company called National Seminars Training by Rebecca Pace. Following are some of my notes from that session. I like to take lots of notes so I can remember most of what is taught and presented. Life is so busy that if you do not take time to note down things, you will forget it very soon. Though I am not a presenter, but there are many occasions where I have to speak such as explaining to my boss why we need to upgrade SQL server, show developer why something is cool and solves problem easier than the older method, also communicating with other vertical teams. Rebecca started the session by asking participants, what they like to get from this session. She gave lots of tips and tricks to each one of us. This took 1 hour and it was immediately evident to me that this session will be interesting. I will be listing my notes in the forms of the tips and put them in various categories. I hope reader of this page will find them useful. People who come to listen to you are either in agreement with you or will be providing resistance. It is better to know your audience beforehand and particularly useful is to know the type of resistance you will be getting. If you fear, you are going to black out, use index cards. Only jot down few words in bold and big fonts as a reminder cue for yourself. Another trick to calm yourself down during the presentation is to put 3 personal items at different location beforehand in the presentation room. So when you are nervous look in the direction of one of your item and it will give you connection to yourself and relax you. Remind yourself frequently that what you have to say is valuable to others. To make your presentation your own like a worn out pajama, you need to present it 6 times. When preparing, always target to the middle of the intelligence level of the group. That is why knowing your audience ahead of time is important. Audience want to know you as a person. So be yourself. Your accent, ethnicity and any other cultural difference make you more unique. Play it to your advantage. Be creative how you present yourself. Do not try to force feed your audience. Lay low on information overload. As a speaker you worry that you don’t have enough content and you over prepare and then you want to give out all this information. Be conversational with your audience. Engaging and creating personal connection is more important than the content itself. Because an engaged audience is going to listen and understand your presentation. Leave the technical jargon for the slides or the handouts. While you speak use common words and simple English. Let your audience take notes, don’t give them everything on the slide and give them handouts toward the end of your presentation. By taking notes they will pay more attention and will retain more. How many slides should you have in a power point? According to Rebecca, for an hour long presentation you should not have more than 5 slides. The reason being you want your audience to engage with you more that with the slides itself. Give additional material in handout. Use lots of colors and visuals. Remember less is more and a picture is worth a thousand words. Use less words. Have 8 facts about yourself on the last page. Preferably 4 of them regarding your professional\business and 4 business\personal details. If you are giving a 30 minute speech, about 4 minutes should be opening to hook the audience to your talk. And if 1 hour talk use 6 minutes. This is a rough guideline. If you are showing video clip, make sure it is not more than 3 minutes. It is very important that you explain what audience is going to see and after the clip engage to get the understanding of the audience. Presentation takes lot of energy from the speaker. You need to be rested and prepared. You have to project your voice to each of your audience. Bigger audience means you will spend more of your energy. Use coffee, or tea with peppermint oil drops, or Singer secret throat spray to dilate your larynx. You will have a richer and more powerful voice. Read book “Voice and the Actor”. If you have a habit of talking fast, then take a notebook on the podium or table and turn pages that will slow you down. Eat some complex carbohydrates before the presentation to low down your energy level if you are a fast speaker. Wear clothes (even undergarments), shoes, hair etc. which are comfortable and forget about them when presenting. Practice editing your face by keeping mirror in front of you when talking on phone. Smile more. Don’t shoot for 100% perfectness in you presentation. Shoot for 85% or greater. Be flexible and ready to roll if conditions changes. For practice, do it before mirror, record yourself, and notice your postures and gestures. Do you look confident? Fake it till you make it. Listen to great speakers like Martin Luther King, James Earl John. Listen to comedy shows. Another example is to notice the difference in Whitney Houston and Dolly Patron delivery of the same song (I love you). Whom I will be talking to? How long is my presentation going to be? Where will the presentation occur? Why I am doing this presentation? Include a little ice breaker in the beginning, even if it is not related to the topic, just to get audience connect to each other. If some people are running late, ask audience if you should wait for them or begin. Speak with more animation that your normal voice. Create more volatility in your voice. During presentation, make eye contact with as many people as you can. To create personal connection with your audience, use any of the following. Improve your communication by listening during your presentation. Don’t plan your response while the other person is talking. Remain objective, don’t get emotionally involved. End your presentation with succinct summary, or a quote or the benefit of the product or idea. End on a positive note and try to get the emotion from the audience. Book: Psychology of Achievement by Brian Tracy. Spirit Gum to train you face muscles. Today, I explained to my internal IT team and a DBA on another team about the advantages of using AG for Disaster Recovery scenario. They had lot of questions and I prepared myself with these documents. I drew the scenario on my board and took the picture of it. I modified the presentation I got from one of the SQL Saturdays I attended. I downloaded Word document on this topic from MSDN site. I think people are hesitant to change because they do not want to come out of their comfort zone and\or not knowing enough about the new technology makes them less confident. They like to stick to Log Shipping because it works. Another uncertainty was about geo-clustering or AG on different subnet for DR. Here I also lack knowledge so I pointed out this would be a good oppurtunity for all of us to learn and we will have one more option for DR in case log shipping feature is not available in future SQL Server releases. Then there was bad experience that the team had several years ago with Failover Clustering. It used to take time for SQL Server services to come up. I know I have lot to do to change the mindset but so little time. 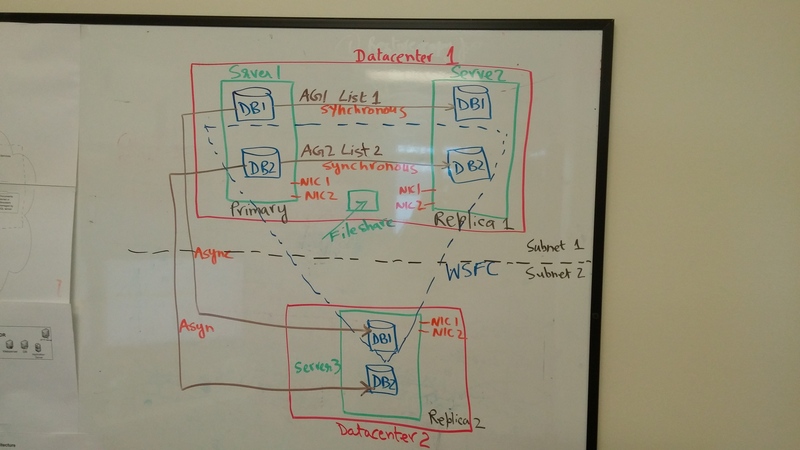 In the end, I got the agreement that we will create one DR box in the second data center where I will do the log shipping and also will include it in my current Availability group configuration. Let us see how it goes.